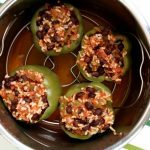 Bell peppers are stuffed with brown rice, black beans and salsa and cooked perfectly in your electric pressure cooker or your crockpot. You can make them vegetarian or with meat, it’s up to you. Top with a dollop of sour cream and enjoy this healthy weeknight dinner. In a bowl stir together the rice, picante sauce, salt, cumin, garlic powder, beans, and meat, if desired. Scoop the mixture into the hollowed out peppers. If using the Instant Pot: Pour 1 1/2 cups water in the bottom of your pot. Place a trivet in the bottom of the Instant Pot. Place the peppers on top of the trivet. You may have to arrange them to fit. Cover the pot and secure the lid. Make sure valve is set to sealing. Set the manual/pressure cook button to 6 minutes on high pressure. When the time is up let the pot sit for about 5-10 minutes before moving the valve to venting. Remove the lid. If using the slow cooker: arrange the filled peppers in the bottom of your slow cooker. Cover and cook on low for 5 hours or on high for 3 hours. Serve the peppers topped with a bit of grated cheddar cheese and a dollop of sour cream, if desired. I have only tried this recipe with instant brown rice. I believe that uncooked, rinsed quinoa or long grain white rice would also work. Let me know if you try it and how it turns out.